New HDBaseT Certified Cat6 cables, HDMI 4K Splitters with HDR, 4×4 HDR HDMI Matrix Switch and USB 2.0 to RS232 Converter add standardized installation capabilities for AV distributors and dealers. Batavia, IL – May 29, 2018 – Vanco International LLC, an industry leader in AV distribution and electronic accessory products, is pleased to announce new product additions to its Vanco brand, renowned to distributors and integrators for comprehensive, value-oriented residential AV products and accessories. The new products consist of 14 HDBaseT Certified Cat6 cables, two HDMI 4K Splitters with HDR, a matrix selector switch with HDR and a USB 2.0 to RS232 Converter, providing the industry with innovative standardized AV solutions. Available in 14 lengths from 50 ft. up to 1,000 ft., Vanco’s new Cat6 cables are HDBaseT certified, are CMR (UL 1666) rated, CE, RoHS, and have a reference standard of UL444, TIA-568-C.2, UL 1666, IEC 61156-5 and ISO 11801. Vanco’s HDBaseT Certified Cat6 cables offer F/UTP and solid bare copper construction, 23AWG 4-PAIR conductors, and are tested to 550MHz, guaranteeing durability and safety for installations of any size and scale. The Vanco HDSP4K12 and HDSP4K14 splitters with HDCP 2.2, 4K/60Hz, and 4:4:4 chroma capability, are the most up to date HDMI splitters compliant with HDCP 2.2 displays and sources. Featuring EDID management and different modes to ensure compatibility with source and display combinations, the new HDMI 4K splitters offer installers greater system-design flexibility and ease of installation. Both the HDSP4K12 and HDSP4K14 support LPCM 7.1CH, Dolby TrueHD, and DTS-HD Master Audio for advanced audio setups. Integrators can take any 4K source and split the signal to multiple 4K displays to ensure the highest quality resolution possible, for any size display. They can also be cascaded with other Evolution™ by Vanco products to create additional output options or to create an expanded distribution system. 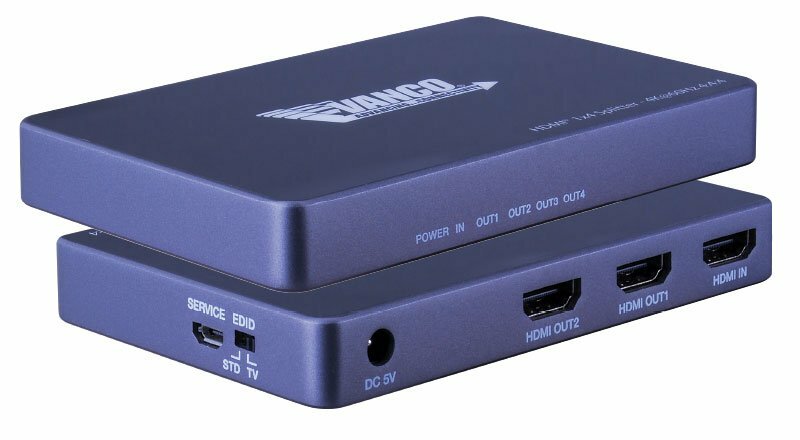 The Vanco HDMX4K44 4×4 Ultra Compact Matrix Selector Switch with HDR, allows four HDMI sources to be distributed to up to corresponding displays simultaneously. The HDMX4K44 allows multiple sources to be displayed simultaneously on any display or have a single source split to several displays, allowing for greater installation design flexibility. Equipped with HDMI 2.0, the HDMX4K44 is capable of transmitting 4K@60Hz, 4:4:4 Chroma Subsampling, and HDR. Control features include an IR remote control for IR switching, as well as RS-232 for third party integration in addition to manual controls. Perfect for installations the require support of deep color and 3D, the HDMX4K44 allows for AV distribution with 4K and HDR via an ultra-compact form factor. The RS232-USB USB 2.0 to RS232 converter offers integrators easy connection of serial devices through a USB port. Compatible with USB 2.0/1.1 specifications, the RS232-USB can be used for PDA, modems and more with data transfer rates of 1 Mbps and more, and remote wake-up and power management. The RS232-USB offers support of serial interface DB9 and is compatible with Windows 2000/Server 2008/XP/ Vista/WIN7/WIN8/WIN10, Linux, and Mac OS v8.6 or higher. Vanco’s HDBaseT Certified Cat6 cables, HDSP4K12 and HDSP4K14 HDMI 4K splitters with HDR, HDMX4K44 matrix selector switch and RS232-USB will all be available in June and on display at InfoComm in Las Vegas, June 6 – 8, 2018 in Vanco’s booth: N3022. Interested distributors can contact Vanco International directly for pricing. For product specifications and to learn more about Vanco International, visit the Vanco website. For more information on the HDBaseT Certification Program, click here.